How do I pray Scripture back to God? And it’s a great question because I believe there are different methods you can use to pray God’s Word. The reader posing this question said “I’m afraid to ask my pastor what he meant by that.” We all have different personalities, backgrounds, and perspectives. And my heart goes out to her. For many reasons, but mostly because I know, she is not alone. So choose the idea to which you most relate, and enjoy the reminder of God’s promises to you. 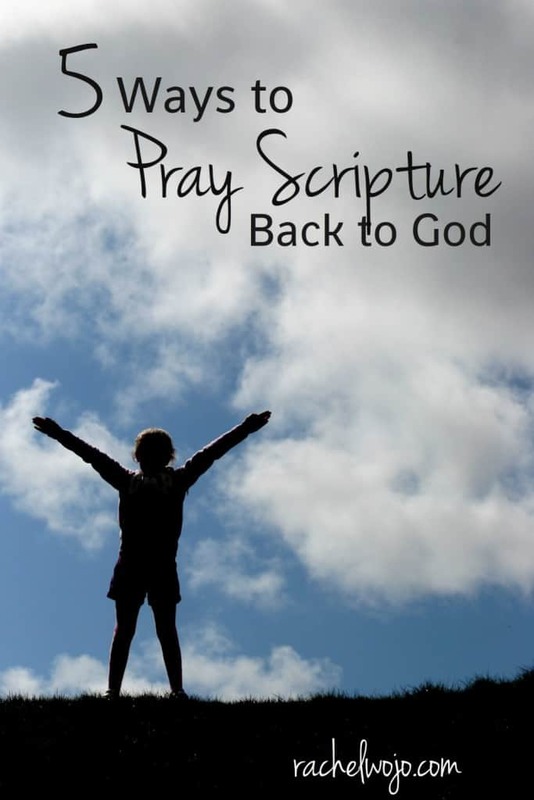 Let’s take a look at 5 ways to pray Scripture back to God. 1. Read the verse to God. I know, it seems simple, doesn’t it? But when we read a verse during our prayers to God, we are reminding God of His Word and he loves this! It’s not as if he needs the reminder. Oh no. He knows his own Word! But he surely loves to see that WE are reading and learning His Word! So in the middle of your prayer, you could just pause and read the verse, asking the Lord to give you a better understanding of what the verse means. 2. Rephrase the verse using your own words. Many times after I have completed my daily Bible reading and meditated on just one verse or phrase, I will rewrite the verse in my own words. Sometimes it is very close to the original wording. Sometimes I substitute a word or two that is easier for me to understand. I often read the daily passage in multiple translations so that I can think through the words and phrasing and gain perspective of the passage. For in Christ Jesus, neither circumcision nor uncircumcision has any value. The only thing that counts is faith expressing itself through love. That last phrase changed my perspective of the entire day. This prayer was both a rephrase and a repeat of God’s word! Isn’t it incredible what God does through His Word? 3. Further define a broad term as you meditate and pray. 4. Substitute synonyms in place of one word of a verse as you pray. The only thing that adds up is faith expressing itself through love. The only thing that means anything is faith expressing itself through love. If you wanted to be thorough in this method, you could use a thesaurus app, online thesaurus, or do a quick Google search. After thinking through the words, pray the isolated phrase to God with your word substitutions and then read the original text to God again, thanking Him for the meaning of His Word. 5. Pray against the lies that Satan promotes against the passage. No matter the truth we read in God’s Word, Satan’s attacks will come in the opposite form. I often find myself praying against the attacks of the enemy when I meditate on God’s Word. When Jesus was tempted in the wilderness, Satan tried to use God’s Word to convince Jesus to sin. But Jesus fired back with the TRUTH! We have to know God’s Word to be able to fight against the lies of the devil, Amen? Choose one of the above ways of praying Scripture back to God and write it out in your prayer journal! 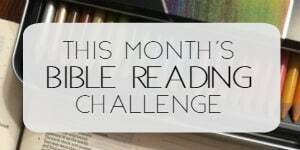 You could begin with a blank journal, writing the date and Scripture at the top, then choose a method and write out your prayer! To the sweet lady who emailed me and asked how to pray Scripture back to God, thank you. Thank you for reminding me of the privilege we have to read God’s holy Word and saturate ourselves in truth, as well as the privilege of praying directly to our Father in heaven, who loves to hear his children whispering his promises, because they know them and want to know him more. 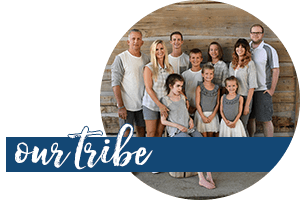 If you enjoyed this post, you’ll love working through the FREE Prayer journal that accompanies Rachel’s latest release, One More Step: Finding Strength When You Feel Like Giving Up. 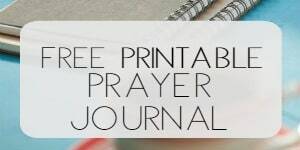 Purchase the book and download the FREE prayer journal companion guide now! Rachel you are such a Blessing sent from God. Thanks for this guide Rachel, I especially liked your idea of praying for help against the lies Satan will try to trap us with, what a great and powerful idea! I have started to pray a Psalm sometimes,I am not diligent enough yet to do it everyday, but what has been working for me is to speak a verse to God, and then, in my own words, apply it to my own life. I do the same with the Lords Prayer, in my prayer journal, writing out each verse and then ‘personalising’ it. I also found that verse in Galatians rather thought provoking, and I enjoyed your unpacking of it too! Thank you for this guideline on using scripture to pray. I’ve pinned it to my Prayer board. Sometimes when I’m discouraged or having trouble sleeping, I “randomly” say in my mind any scripture I’ve memorized that comes to me. I started memorizing scripture at the age of 3/4 through a program called “Bible Memory Association” and did so through high school. I can tell you, I learned a LOT of scripture. I’m so thankful my mother pushed me to do this. In the still of the night, it amazes me how many scriptures I can bring to mind. Thank you Rachel for your ministry. You are touching many many lives. Praying for your family and your sweet daughter. These are really great and helpful ideas… thank you for sharing them!